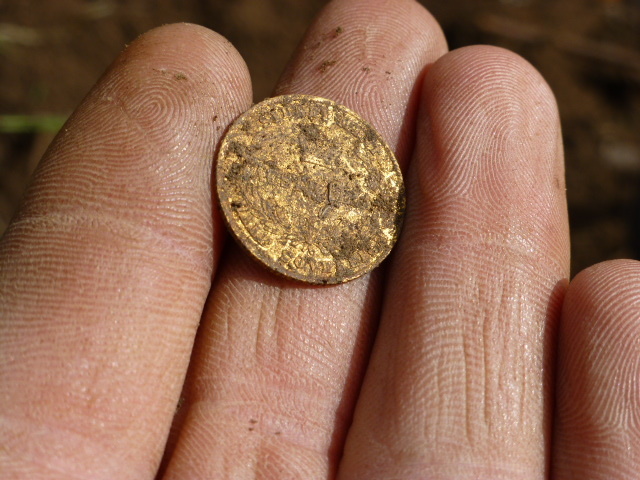 Discover Treasure Tim’s finds and wisdom he shares when metal detecting for coins & relics. I recently found a group of old gold diggings in the Greater Bendigo area which upon inspection didn’t appear to have been detected before, or at least not recently, so I was fairly keen on grabbing either the GPX 5000 for gold, or my CTX 3030 for the relics left behind by the old miners. I fired up the GPX 5000 with a mono coil just to get an idea of the extent of the metal objects laying around, and immediately I ascertained they had not seen a detector before due to the high volume of rubbish targets. It was then I decided to use the CTX so as to discriminate a majority of the unwanted junk targets. 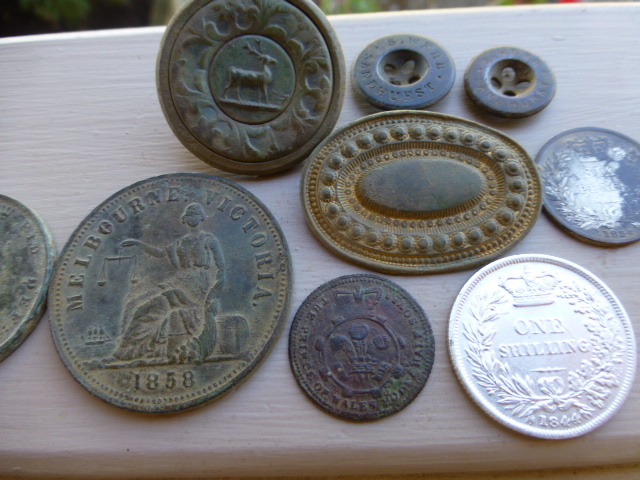 Within no time I had a pocket full of old miners buttons, belt buckles, brooches, and various other lost personal items. These diggings would have most probably been worked in the late 1850’s to early 1860’s. 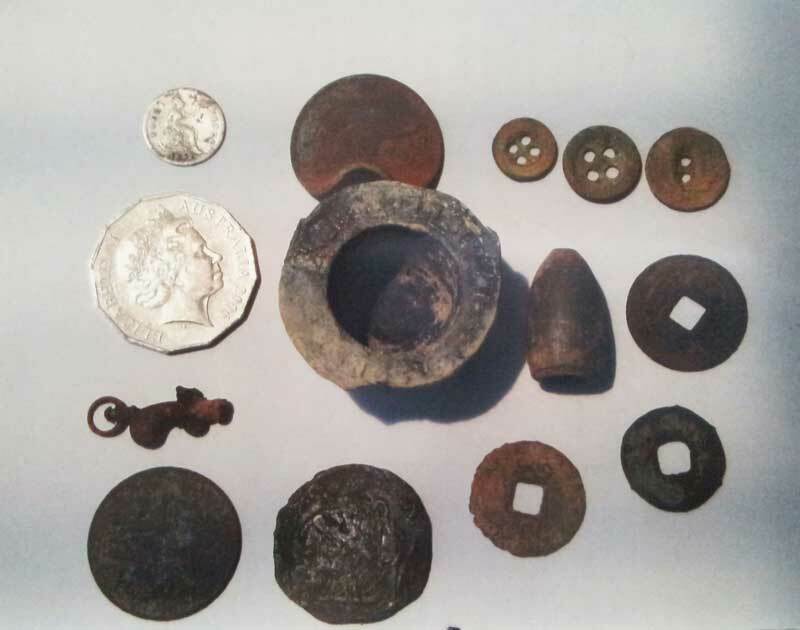 Here are some of the many coins and other items found with the CTX at this site. 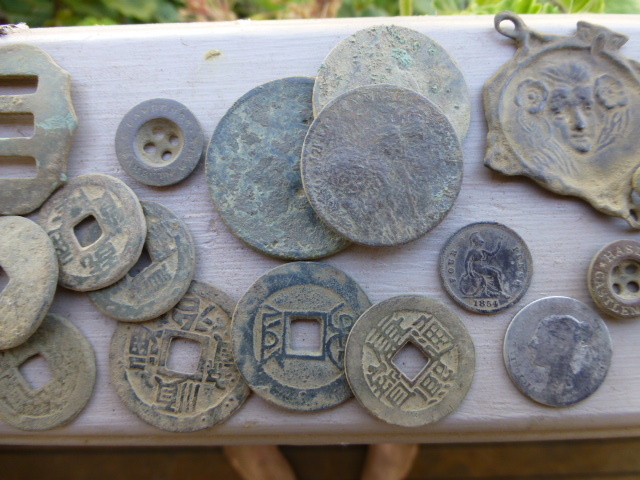 Chinese and European coins were found. The tailings heaps would most probably contain a few pieces of missed gold too, which is a job for the GPX 5000 another day. 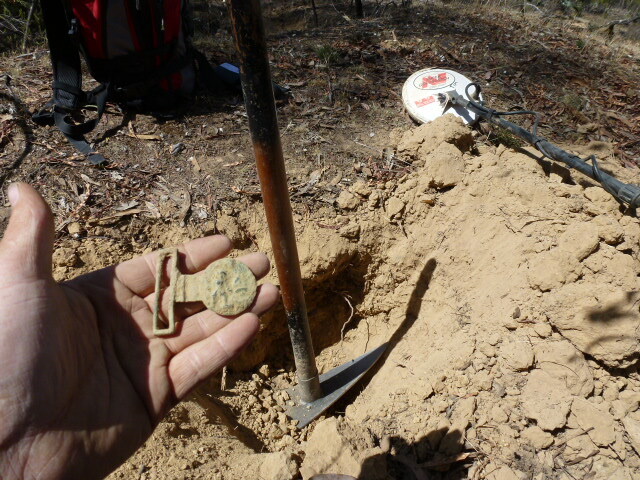 A few days before Christmas, I went out bush in search of likely coin/relic hunting areas near Bendigo, of which there are plenty, but most I’ve found had seen a detector or two over the years, and most of the easy targets had gone long ago. I managed to locate a small settlement site, with the remains of several stone houses in a row which I guess date around 1850’s or 1860’s. The easily accessible location of this site discouraged me a little, as I was sure someone would have detected it before me. The first house site I decided to detect around immediately excited me, as I was finding many easy objects all around it, which would suggest I was the first there. Within perhaps half an hour I had a strong 12:28 signal on the Minelab CTX 3030 metal detector which I proceeded to dig without caution, with a gold sovereign the last thing on my mind at the time. Hastily, I scraped the shallow target out and saw the glint of gold sitting on top of the dirt. After picking it up, I knew what it was which obviously excited me greatly until I realised that I had lightly scraped its face with my digging tool. 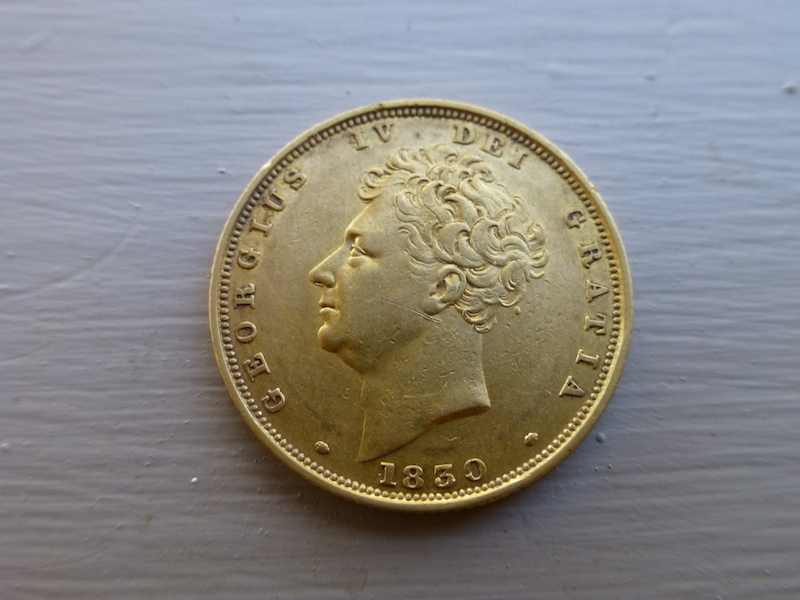 A beautiful 1830 English full Gold Sovereign. I moved onto the other house sites in the settlement and began to notice many dig holes by other detectorists, even a pile of dug up junk targets placed on the rocks. I thoroughly detected them and yielded virtually no targets. I still can’t understand why the first site I decided to detect had not been touched, and the others immediately adjacent had been completely hunted out. Perhaps if I began detecting the others first, the discouragement of them may have sent me away early and not bother continuing on. I can picture this happening to me, and can only suspect this was the case for others. I have since changed my recovery technique! I hadn’t had a spare full weekend to go relic hunting with my Minelab CTX 3030 for a month or so since I was lucky enough to find an 1856 Sydney mint half sovereign. Saturday I had walked into an old mining area in central Victoria which had been mined by hundreds of diggers from about 1852 through until about the 1870’s or so. Normally most of these areas have been detected by someone over the years but I immediately noticed that there was a lot of easy, large non-ferrous targets laying around on the diggings, and shallow, which suggested I may have been one of the first here! This is always exciting, but rare to find these days for myself. Encouraged by this I spent most of Saturday digging hundreds of old metal objects with some interesting finds including a nice cricket belt buckle and a few silver shillings, among other things. 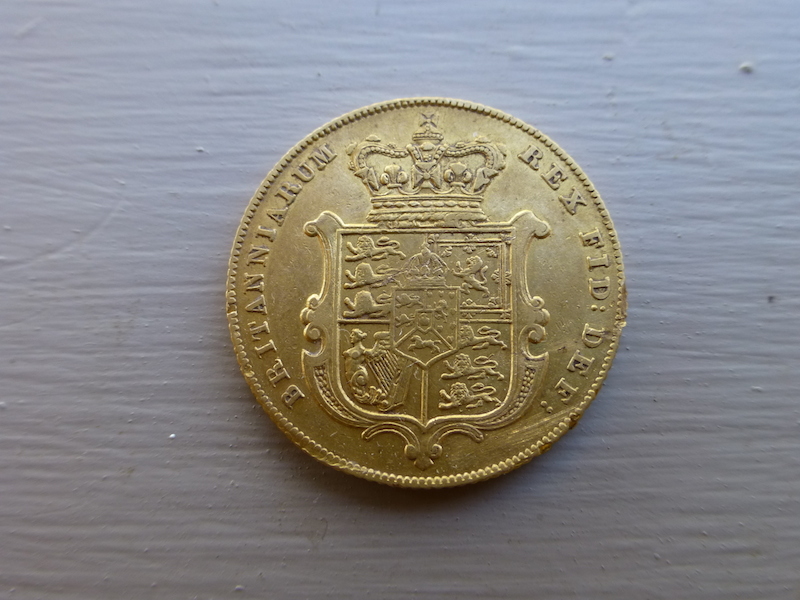 It was a large area and I hoped that if I spent time and dug everything, that I could be lucky enough to find another gold sovereign!! This has always been on my mind since finding my first one 2 years ago! The Sunday I went back to the same area and it wasn’t long before I had another gold coin in my hand, from only about 5-6 inches deep !! This time, a beautiful 1858 Sydney mint half sovereign, and in exceptionally good condition. I couldn’t and still don’t believe my luck. I was also lucky to find a nice traders token and yet another cricket themed buckle. I hadn’t had the relic detector out for about two months so I was fairly keen on a couple of days out the bush with the Minelab CTX 3030, hoping to find another coin or two. I had chosen a spot which I, and many other detectorists over the years had found many old items from the original miners, as well as some gold nuggets. I was prepared for targets to be scarce and few in this location but i was in the right mood and felt that it was worth putting in the hours for possibly nothing. I obviously had a little faith that this “thoroughly detected” location still had a treasure or two left if i put enough time in! After perhaps 6 full hours of detecting with only a small handfull of missed “junk” targets I was becoming increasingly discouraged by my choice of detecting sites, with my mind telling me I’ve wasted my time. In this state of mind, my detecting technique often becomes sloppy and deteriorates as the day progresses. It was while in this mood that i casually swang the coil over a very brief and vague target and it didnt sound to me like the detector was very sure about it. I almost ignored it, but for some reason I stopped and slowly investigated it. Still being unsure if it was even a non-ferrous target, I scraped back the compost surface probably 3-4 inches and retried the signal. Getting the coil those few inches closer to the target now convinced me it was a definite non-ferrous target, and being a 12:21 ID, I briefly assumed another button was down there, as some other brass buttons that day were the same or very similar ID. I was surprised how deep I had to go down for a button (about 7 inches), but when I finally had the target out, I kneeled down to locate it with the PRO-FIND 25 probe, but I didnt need it, as i saw the unmistakable glint of gold in the sun, sitting on the pile of dirt in the shape of a coin! 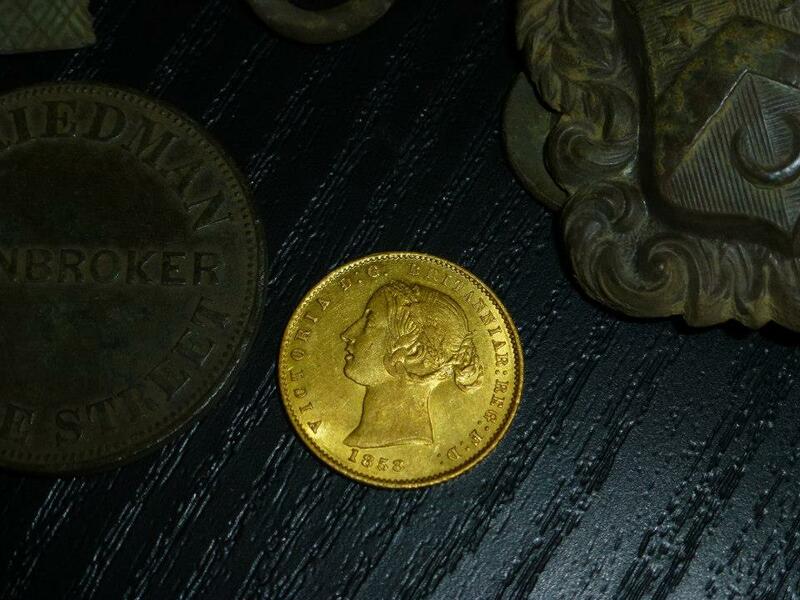 Before I picked it up, I already knew it was a half sovereign ! I spent a few minutes with my water bottle carefully washing it avoiding any touching or rubbing to see what date was on it. I was delighted to see the words “Sydney Mint” come up, and 1856 on the other side. After that excitement had subsided a bit, I remember telling myself , “it was worth the patience and perseverence after all”. I still have faith in all these so called “flogged areas” if I have the patience, and it sure pays to check every little signal, regardless of how “iffy” it sounds. 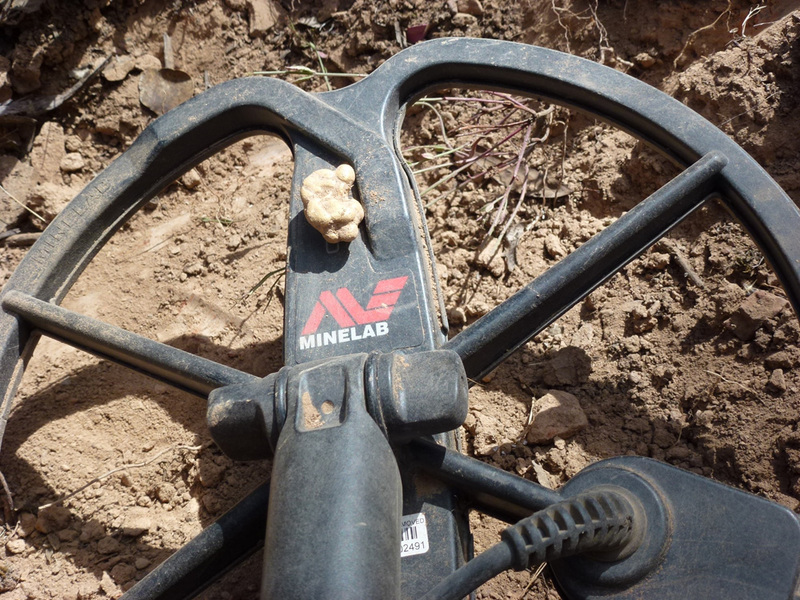 Watch below as Treasure Tim unearths a 4 gram gold nugget using a Minelab GPX 5000 Metal Detector. 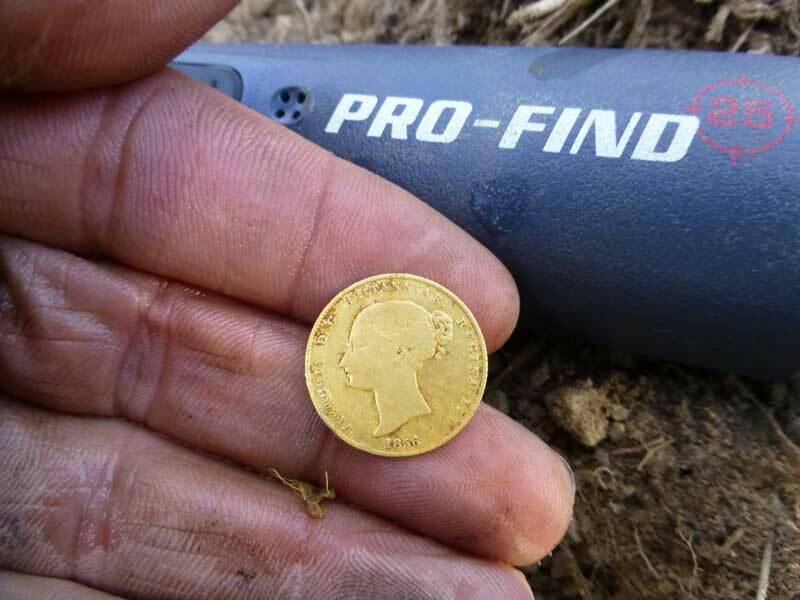 The nugget was found at about a depth of 6 inches using a Minelab 8″ Monoloop Coil. Great Find for 15 Minutes Detecting! I was eyeing off a very small isolated patch of early reef workings outside Bendigo and each time I drove past had wondered whether they had been detected before, so one day I decided to walk over to the lone mine shafts and detect around them for coins/relics. I could see a lot of nails and iron rubbish on the surface so I grabbed the minelab E-trac and began detecting around them. Not finding much at all other than iron junk I was about to leave when I got a very strong, high pitch non-ferrous signal. I immediately recognised the signal as potentially a large copper coin and began digging. 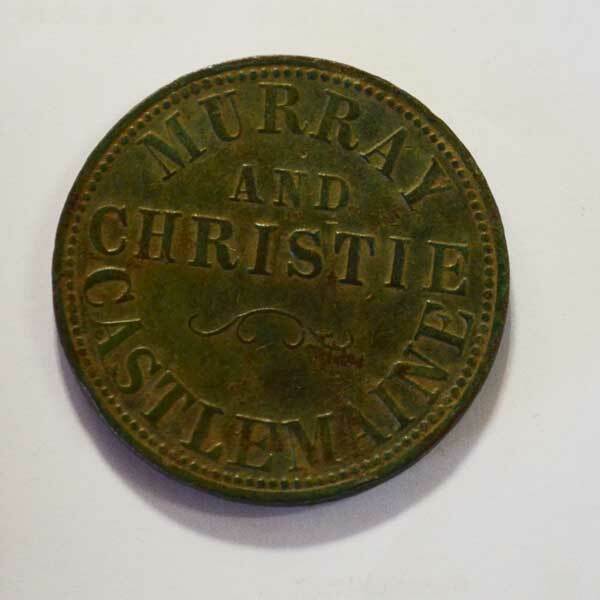 Within only about 2-3 inches I uncovered the Murray & Christie Castlemaine merchant penny token in good condition. I recently found several photos of the original Murray & Christie building in Mostyn Street Castlemaine. Murray & Christie were ironmongers, and merchants in china and glass ware. I have located several pictures of the store from between 1861 and 1865 and it appears they added a second story to their store in about 1862. I will update this post shortly with an image of the orginal building. Treasure Tim strikes it lucky again! Going back to the site where I found the 1oz gold nugget with my Minelab CTX 3030, I took out my Minelab GPX 5000 to see if I could pick up some more gold nuggets. I spent most of the morning digging junk targets but did manage 15 small pieces. In total for the half day I found 8 grams of gold, including a nice 4 grammer. I also found a great Californian gold rush belt buckle from around the late 1840?s period. It was found about a foot deep in old gold workings. There is so many targets still to dig in this site i anticipate months of digging ahead. Below are images of some of the finds for the day. 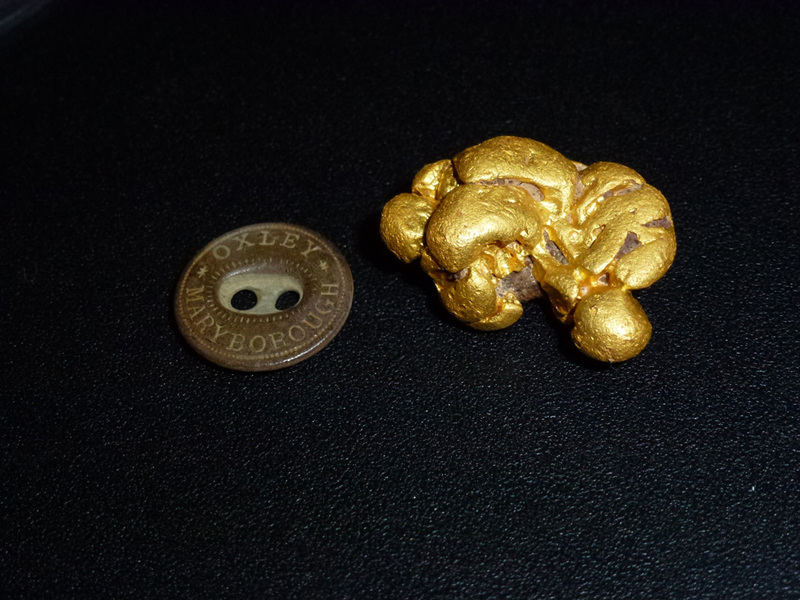 Accidental 1oz Gold Nugget find with a Minelab CTX 3030! 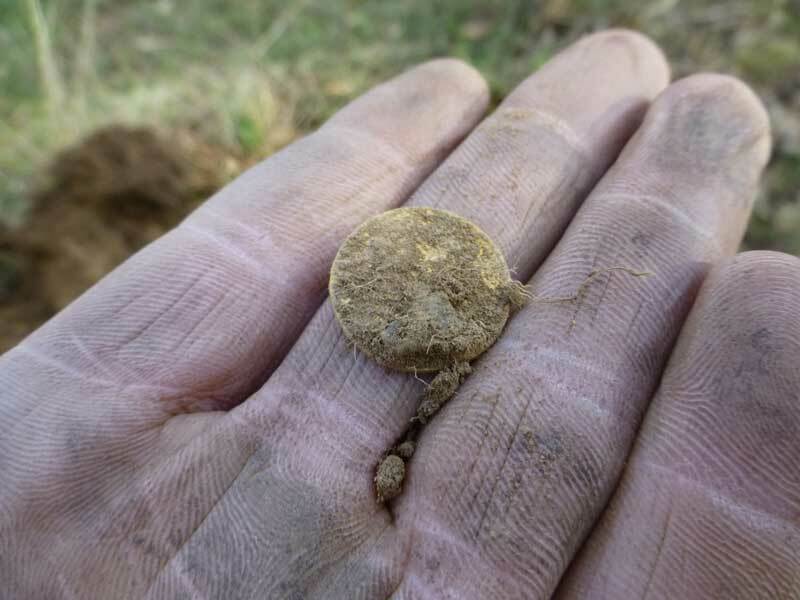 So I went back to my favourite coin/relic site near the old gold mining camp to try find some more coins and buckles I may have missed previously with the Minelab CTX 3030. On the side of a steep slope which leads into the gully I dug a target which, on the CTX 3030 was the same ID as a sixpence, and since I had dug many here before I was excited to think I may have another. After 4 inches digging hard clay I was very surprised to see this little beauty in my hand. I never once thought I had any chance of finding gold nuggets in this location with this detector . Note also, the detector wasn’t even ground balanced ! The sunburn and 2km walk into the isolated mining camp was worth every painful step. Next time i go back, i still wont be expecting this again.. Absolute fluke. 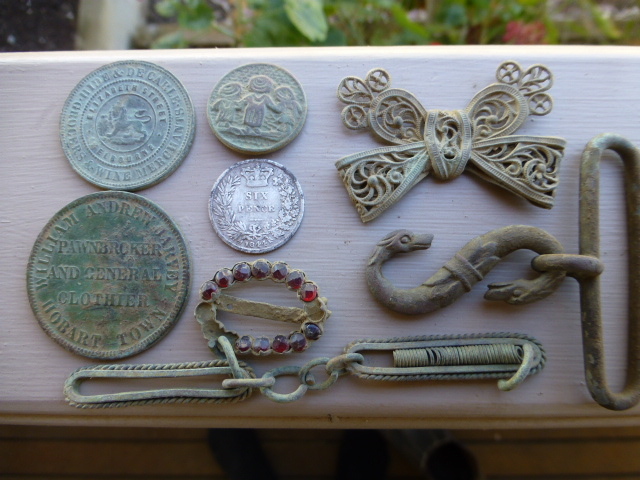 A BendigoGold customer sent us photographs of some of his finds that he had found with a recently purchased Minelab GPX 5000. 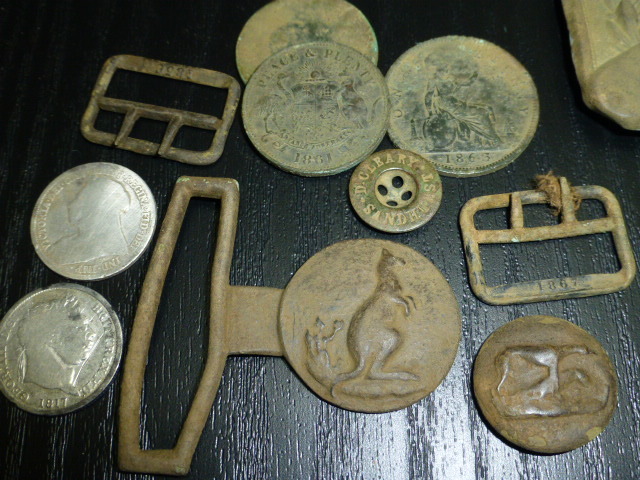 All the finds were found within 20 minutes of the Ballarat Area. 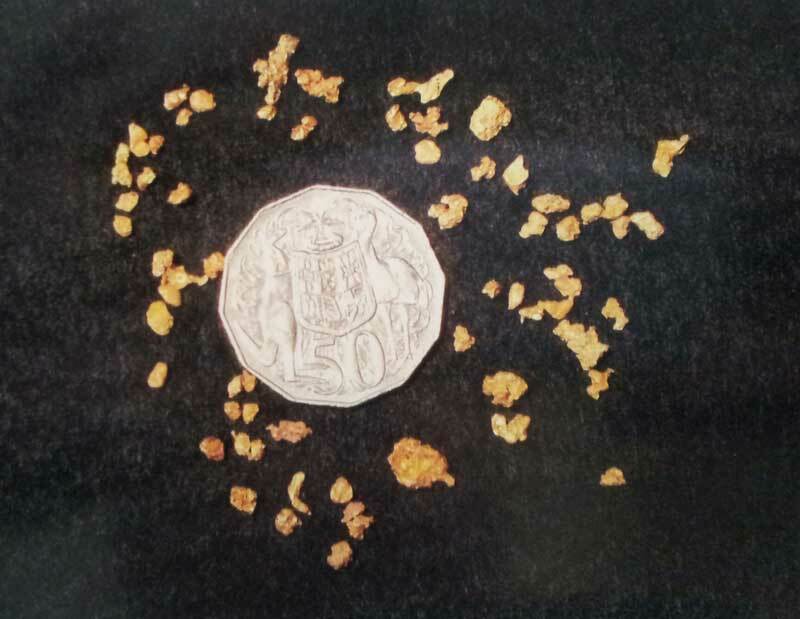 Above is a sample of the gold nuggets that were found. The fifty cent coin is for size comparison. 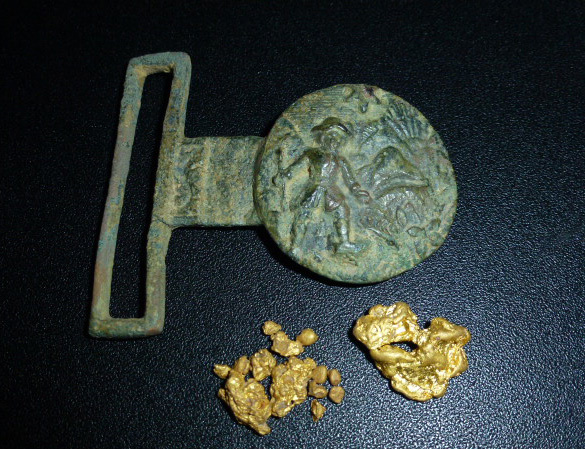 The treasure finds above were also found with the Minelab GPX 5000. There is also one rather large bullet bigger than anything the customer had seen before. Not long after I purchased the Minelab CTX 3030 treasure detector, I went over many sites that I had already detected with the Minelab E-TRAC and found a lot of stuff that I had missed. 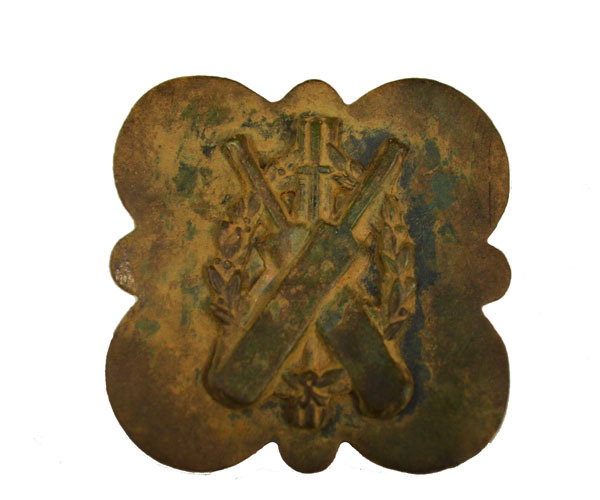 This cricket belt buckle was found at a new site I found while detecting my old spots. 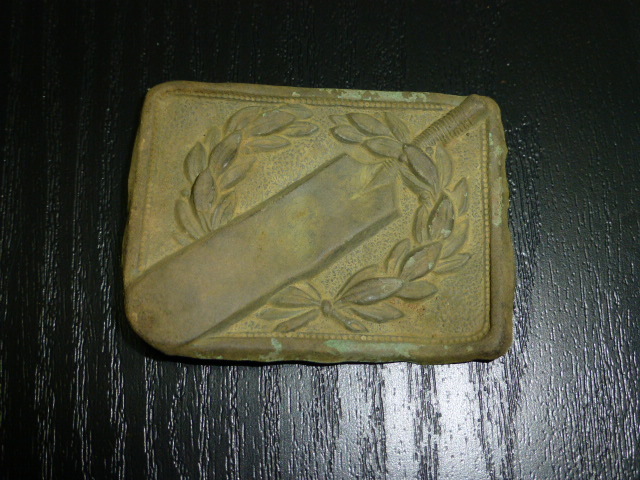 It is the first cricket belt buckle found with that I have found with the Minelab CTX 3030. I was happy to find it in one piece and with its centerpiece.